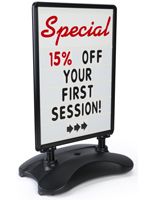 This 47" outdoor letterboard with fillable base comes complete with a set of more than 330 vinyl letters, numbers and symbols. 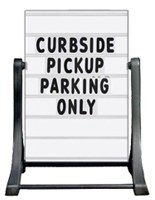 Each 2-sided 24x47 white board features holders for up to 7 lines of text and incorporates a cut-in handle at the top for portability. 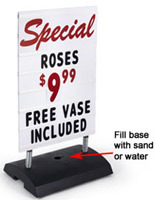 The weather-resistant changeable letterboard with fillable base has a round sign support that can be weighted with water or sand. 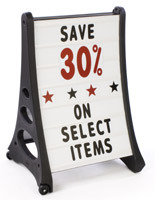 For maximum ease of transport the 2-sided fixture has wheels hidden in the bottom for "tip and roll" movement. 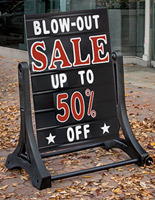 This vinyl lettering board with fillable base and wheels is great for creating changeable messaging in any environment. 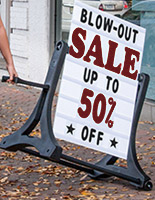 This type of fixture is ideal for use by retail establishments, restaurants and service businesses for up-to-date advertising of events, specials, sales and more.